Bio: Gregg Rosenbery is an Analyst in the Security & Access Section of the Michigan State Police (MSP). In his current role, he is responsible for the review and interpretation of the Federal Bureau of Investigation (FBI) Criminal Justice Information Services (CJIS) Security Policy. This federal policy provides for the protection of criminal justice information (CJI), the personally identifiable information attached to that CJI, and the systems that access, process, transmit, modify, and/or store CJI. As part of his responsibilities, Mr. Rosenbery travels the state of Michigan teaching courses to local law enforcement agencies on how to properly understand and implement the requirements of the policy. Prior to joining the MSP in January 2016, Mr. Rosenbery was a Lead Detention Officer with the Lansing Police Department (LPD), retiring in December 2015. While with the LPD, Mr. Rosenbery was the Local Agency Security Officer and Terminal Agency Coordinator responsible for interacting with the MSP on matters related to CJI system security, and all aspects related to the Law Enforcement Information Network, or LEIN system. He was also a Field Training Officer, a certified Defensive Tactics Instructor, and an American Red Cross and America Heart Association-certified first aid, CPR and AED instructor. 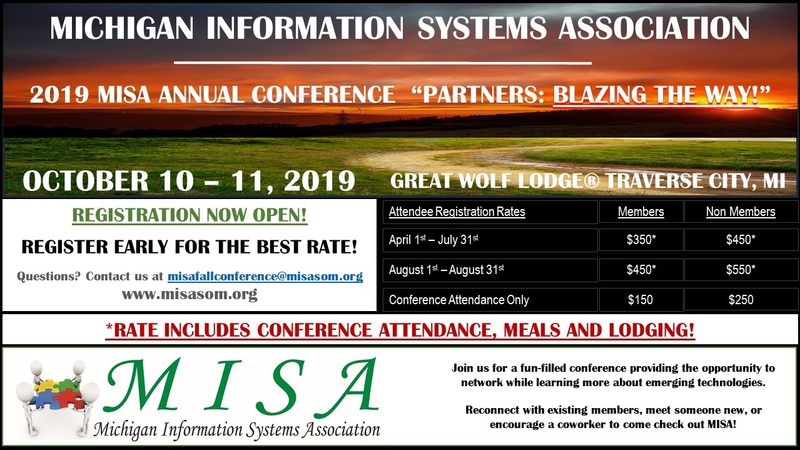 You are invited to attend the 2019 MISA Annual Conference! Early bird rates are available through July 31st. Register early to get the best rates! Full Package registration ends on August 31st. Conference Only and Meal Package registration will be available through September 10th, but these packages do not include lodging. You will need to make your own lodging reservations. This year's theme is Partners: Leading the Way. Great Wolf Lodge is offering a special discounted rate for Tuesday/Friday/Saturday night stays! See this document for more details on the conference and how to contact Great Wolf Lodge to book these nights! NOTE: The conference registration fee includes Wednesday/Thursday night lodging and Thursday/Friday breakfast and lunch. Conference Attendance Only rates are also available. We're looking forward to seeing you in beautiful Traverse City! 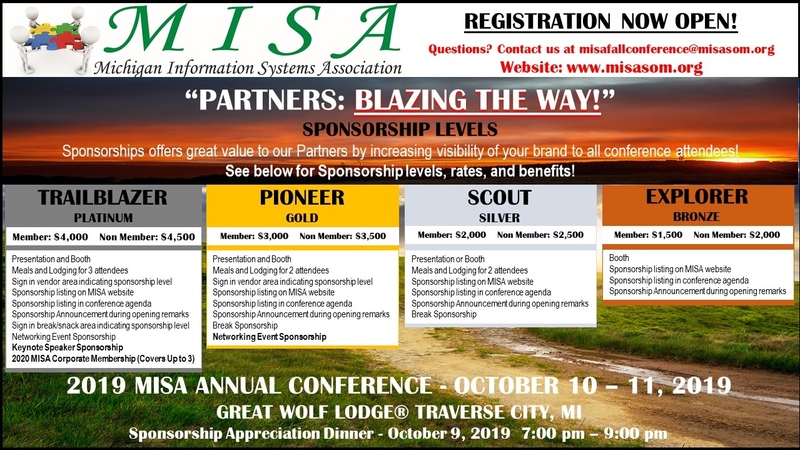 Vendor Registration is open for the 2019 MISA Annual Conference! This year's theme is Partners: Blazing the Way. Every fall conference provides a venue for new learning opportunities for State of Michigan IT employees and their vendor partners, and this year is no exception. We invite you to take this opportunity to present on leading the way to better partnership opportunities. See below for our new Sponsorship Levels! If you have any questions or need help with registration, please contact us at misafallconference@misasom.org.